NAPPY is a crucial book for our precious children. Don't miss it!" said Dr. Cornel West, Princeton University Professor. "A celebration of self-worth, cultural awareness and strength is woven neatly throughout the pages of this beautifully illustrated tribute to women of African ancestry and their 'super-nappturally Nappy' hair. The story, though joyful and light-hearted, contains a powerful message about history, heritage and high self-esteem. NAPPY is not only a children's "hair story." It is a history lesson and educational tool for parents, teachers and older children. The book's back matter contains biographies about each of the Black women honored in the story, alongside beautiful original sketches of the women. 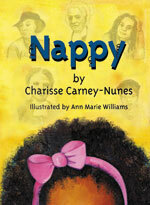 ›	Black Caucus of the American Library Association Newsletter recommends Nappy. July 2007. Read here (Scroll to page 20). › Nappy, a Children’s Book for the Ages. Mommy Too Magazine, April 2006. Read here. › Nappy, a Poem to My Daughter. East of the River Newspaper, February 2006. Read here. ›	ABC News Now Anchor, Ron Claiborne interviews Carney-Nunes about Nappy and the Imus controversy. April 2007. Read here. (Transcript).